Nervous energy filled me as I prepared for the Alpenglow 20km Skate Ski race last weekend – my first ski race in almost a year. It had been over three months since I wore any sort of race bib (at the Bizz Johnson Trail Marathon), so I was certainly excited to get back in the mix. I remembered the course, which I’ve skied just once before, as beautiful, fun and challenging; it did not disappoint. The Alpenglow race takes place at the Tahoe XC center in Tahoe City, California. Although it is just 20 miles from my home, I only make it over there a few times each winter (usually for ski races). Even though I have only limited trail familiarity, I do enjoy a bit of a home field advantage thanks to the familiar faces among the racers and spectators. Long story short… I forgot my skate boots at home, which I realized about 40 minutes before the race start. My husband kindly agreed to load up the kids and attempt to get them to me, but there was just not time for it. I was ready to use this excuse to bail on the race, but then I recalled my $50 investment in race wax (see below). As a last resort, I quickly asked and received a pair of demo boots from the Kevin, the awesome general manager at Tahoe Cross Country!! The boot screw up solidified my feeling that I need new boots! My current skate boots are two years old and fit like comfortable slippers. This has been great for the long training tours that I’ve been putting in lately, but not optimal for racing. Later in the week I bought new boots ~ same pair that I demoed, but a size smaller. If you’ve been in Tahoe lately, you probably know that winter started and stayed with a burst of snowy coldness. A quick survey of my ski wax supplies revealed that I did not own a race wax good for these very cold temperatures. Uhg. 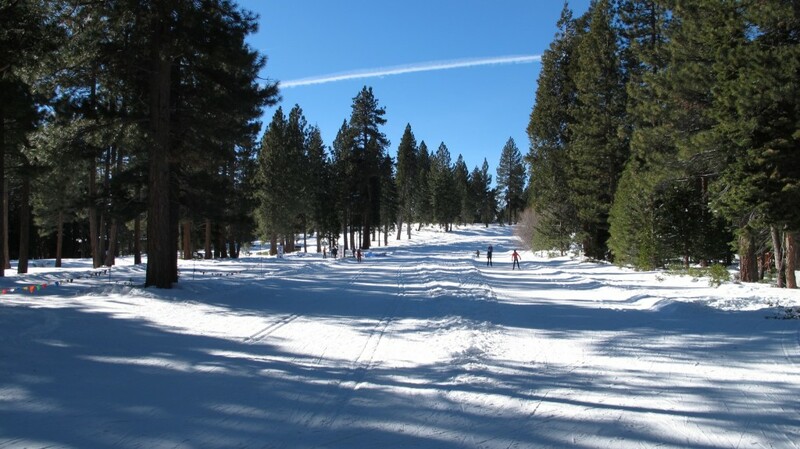 Is it worth the better part of a bill to purchase race wax rarely suitable for our typically warm Tahoe snow? I decided yes. I always feel a delightful spike in satisfaction and race-day confidence when I prepare my own skis for a race. I was happy with how they came out. [Warning: geeky tech talk follows.] I laid down a base layer of LF moly mixed with LF blue Toko waxes. I opted for an HF “very cold” wax by Star Ski Wax, which is a more affordable brand that is carried by Sierra Nordic in Truckee. I threw in a few drops of Toko HF red for good measure against the warming snow later in the race. My skis ran fast on race day on consistently cold snow. Any race shorter than 2 hours is essentially a sprint in my world. And I have not been training for a sprint, but quite exactly the opposite. Most of my training efforts right now are focused on building endurance for the inagural Gold Rush 100k foot race in May. I examined my past experience with this race to develop a strategy. Here is what I remember from my performance at this race two years ago: 1.) I fell on one of the descents; 2.) I wasted energy passing a skier on an uphill who later passed me anyway; 3.) I ran out of gas in the final 5k. Sadly, I had not committed any time to improving my lacking descending skills, so I just had to focus. The cold, slightly soft snow worked to my advantage. One downhill caught me by surprise and I had to simply command my body to not fall. That worked out barely OK and I made it to the finish without taking a spill. While this downhill approach was fine for self-preservation, it did mean that my good friend and ski pal, Jody, was able to pull away from me on each of the downhill sections, enabling her to cross the finish line a half minute ahead of me. She kindly shared some tips after the race and I have been practicing descents this week, but progress is incremental at best. I am happy to report that I have learned my lesson about passing only when necessary and sure. I hung out behind another skier for the first half of the race. She seemed to be getting tired and peeled off at the aid station just before the big descent. I was so terribly happy to be on the trail by myself for the downhill, but still be able to see and be pushed (or pulled) by Jody ahead of me. Finally, I was thrilled to notice that my base aerobic fitness helped me to recover from the hill climbs quite quickly. Also, I was able to ski strong throughout the final quarter of the race, despite the appearance of a number of short climbs. I am no longer sure if I am a skier who runs or a runner who skis, but I do know that I am very happy doing both! Alpenglow Sports, for sponsoring the race and for the $25 gift card – yeah, baby! Well, you sure rocked the Skogsloppet this weekend!